Welcome back to this blog series where I try to give you something to chew on so you can start capturing better photos with your phone—without having to wade through a mountain of technical details. If you missed the last two entries, take a few minutes and check those out. We laid some important foundation last week and whether you’re following along or not, it’ll help you. This week, we’re going to touch on the five major contributing factors that will affect the quality of your everyday images. This is not an exhaustive list, but they’re the only things that are really going to matter to you who does not wish to become a ‘photographer’, and just wants to enjoy nicer images in general. They are clean lens, lens flairs and clarity, low light and motion blur, camera focus, and some miscellaneous limitations of technology. Lets dive right in. Every image you create with your phone starts as light bouncing around the atmosphere and ends after it passes through the lens and lands on the camera sensor in your phone. There’s a lot of math in there, but we won’t touch on it because it doesn’t matter. What matters is, no matter what device you have and use, light must pass through the lens in order to land on your sensor and become a picture. So, if you want to enjoy better photos, before you consider anything else, how’s the lens on your phone looking? Is it foggy, muddy, scratched, cracked, dirty? If you answer yes to any of those, you need to deal with that first and foremost. Luckily, the lenses on most camera phones today sport some impressive durability and more likely than not you just need a lens cloth to clean it up real quick. Do not use soap or water to clean your lens, and avoid using coarse fabrics like paper towels or toilet paper, even if they feel soft to the touch. You’re likely to leave residue behind or worse, create micro scratches that exacerbate “lens flair”, which we’ll touch on shortly. TIP: Purchase some lens cleaning wipes, like you’d use for a pair of eye glasses. Or, pick up some microfiber cloths which don’t require any moisture at all. Bonus, both of these products are good for cleaning the front of your phone, and your glasses as well. If you don’t know what lens flare is, you’d recognize them immediately if someone pointed it out for you. Lens flare takes place any time you shine light directly into the camera lens (Hint—like the sun on a clear day). A perfectly clean, spotless lens will have very little lens flare, but you’ll notice small, often colorful ‘orbs’ of light that move around according to the light source creating them. They’re sometimes used to stylistic effect in Hollywood and elsewhere a camera is being used creatively. The creative, stylistic lens flares however are not really what we’re talking about here. What we’re talking about is more of a ‘lens wash’. When the phone sits at the wrong angle, and a bright light source flows directly into the lens, the whole seen gets ‘washed out’ with a bright hazy overlay. This happens when light hitting the lens itself is picked up by the sensor, rather than the light bouncing off stuff in front of the lens. The effect of this kind of ‘lens wash’ or ‘haze’ causes a serious reduction in the quality of the image. So, to fix it, first, make sure the lens on your phone is clean. Second, prevent the light source from entering the lens directly. In other words, put something between the camera and the light source, and the lens flare will go away. If you’ve ever seen those big cup-shaped things attached to the front of professional camera lenses, that’s what they’re doing. They’re helping to prevent bright light sources from directly entering the lens. TIP: If you’re dealing with a nasty lens flair on a bright day, hold the phone in one hand and use your other hand to create shade for the lens. As long as the lens itself is under a shadow cast by the brightest light source, you won’t have any problems with the lens flare and your image should come out crisp and clear. As I mentioned at the beginning, all photographs start as light bouncing around the atmosphere. So, when there isn’t very much light bouncing around (such as at night, or in a dark room), creating pictures becomes a peculiar thing. Even a lot of semi-professional photographers quake in their boots when the lights get dim. In spite of some impressive advances in phone technology, capturing images in low light situations with a phone is still… not great. Professional cameras solve this by giving light more time to hit the sensor (shutter speed), or by making the opening in the lens larger and allowing more light in at once (aperture), or by introducing additional light to the scene (e.g., a camera flash). But, the only method to dramatic effect that exists for phones is to make the camera’s sensor more sensitive to light (ISO). When a phone makes the sensor more sensitive to light, it also creates an unappealing “grainy” quality to the image, and to make matters worse, our phones will go through a number of automatic processes to try and eliminate that grain, which in turn can give the images a kind of ‘watercolor’ look that lacks photographic detail. In an attempt to mitigate these effects, the phone is also going to try and get more juice out of the darkness by giving the light more time to land on the sensor, which in turn causes any motion in the scene (including the motion of the phone itself) to become a blurry mess in the image. To get a decent photo with your phone when it’s dark, first, lower your expectations. Specialized equipment is often necessary for this task and the fact your phone can do it at all is impressive. If you’re not satisfied with that, do your best to find some light. Any light is better than no light. If that’s not an option, turn on the phone’s flash. But, save the flash as a last resort because the results, especially in images of people, are typically unflattering. And, if your subject is further than about 5 feet away, don’t bother with the flash at all, it will actually make the results worse. LEARN MORE: If you want to take this more seriously, or understand the challenges of low light photography more completely, read in more detail about Shutter Speed, Aperture and ISO. Focus in photography is not altogether dissimilar from using a magnifying glass. There is a perfect distance between you and the glass, and the glass and the thing you’re trying to magnify, at which the image through the magnifying glass is clear. This is over simplified, but essentially the same thing that’s happening in your camera lens. The glass on your lens is changing the distance between itself and the sensor in order to get the light passing through to land on the sensor clear and sharp. If you get too close to something, just like a magnifying glass, it will be impossible for it to focus. For most phones, that’s just a matter of inches, for others, it may be feet. Luckily, for people using phones to create images, focus is rarely something you need to think about. Most phones are intelligent enough to identify faces and lock the focus onto them. And, if for some reason your image is out of focus, just tapping on the thing you want to be in focus will fix it. One place where there is a significant exception to this is, again, when there’s not enough light. If you pull your phone out in a dark room, you shouldn’t be surprised to see the preview blurring and unblurring as the phone attempts to make the image sharp. If you’re having trouble with focus, especially in a low light situation, try tapping on an area of high contrast in the image. Many phones use the contrast in the image to figure out when its in focus, so if the camera can’t figure it out itself, this often solves the problem. Something else to know is that all lenses have a ‘focal range’, from maybe just a few inches away to around 10 feet away. Anything further away than about 10 feet is what photographers call ‘infinity focus’. If you focus on anything more than 10 feet away everything will be in focus. But, anything closer than that needs to be tapped on in the preview to get it to fall into focus. On a phone, this can be tricky because although something 5 feet away may look like its in focus on the screen, in actuality, the camera may have focused on something 3 feet away, or 8 feet away, and hence, what you meant to take a photo of will be blurry. TIP: Virtually all phones will use some kind of graphic interface, often represented by a box, or a pair of brackets or two parallel lines. Use that interface to notice what the phone is focused on. If it’s focused on something else, correct it by tapping on what you wanted to focus on. Not all things photographic are possible, and not all things possible are going to have good results. Modern phones differ from traditional and professional cameras in a lot of ways, and in one very important way. Phones frequently rely on what is called “computational photography”. In other words, the phone will try to use computer algorithms and even AI to try and make your photo look better, or as if it were taken on more expensive equipment. Or, sometimes even fill in details that weren’t really there. This can create some unexpected effects which can be frustrating if you don’t know what’s going on. For one simple example, if your phone has two lenses on it, it may use those lenses to create a variety of effects such as blurring the background to mimic professional camera lenses, tweaking the lighting to mimic professional light equipment, or allowing you to zoom in to mimic expensive zoom lenses. Under the most ideal conditions, these effects are quite impressive, but under everyday picture taking conditions, they can really muck things up. One good piece of advice is if your camera has the ability to zoom, don’t do it. For most phones, all ‘zooming’ is doing is ‘cropping’ the image before you take it. The quality will look crummy, especially in low light. If you’re phone has two lenses on it, then one of those lenses is probably for ‘zoomed in’ photos which are great during the daytime, but likely not activated at night. So, in most cases when it comes to your phone, it’s best simply not to zoom at all. Likewise, the photo effects such as blurring the background or changing the lighting can work well under ideal conditions, but quite bad otherwise. Don’t use a ‘background blur’ effect on images with a whole lot going on in the background, or where there is a lot of motion. Using this effect with trees nearby in the background, where branches are going every which way, will leave an unmistakeable jaggy edge around the thing in focus, and those lighting effects are going to look like a bad photoshop from 2001 unless the real world lighting is very flat and mostly lacking shadows. TIP: Use the various phone effects only when there is lots of light (such as a sunny afternoon), and when you’re able to slow down a little bit to get the photo you want. 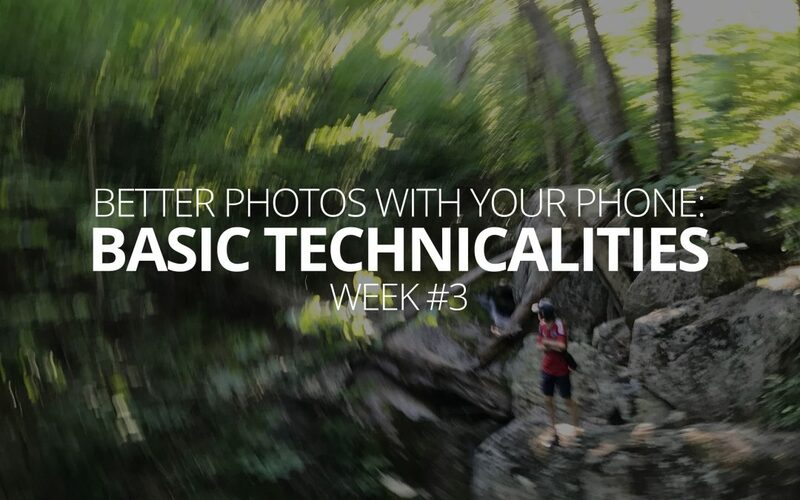 In the next entry, we’ll be diving into some of the mindset required to capture a good photo. Why this, why here, why now, why in this way? Photography is not chiefly about what your camera is doing, but rather what your mind is doing. So next time we’ll begin digging into the that side of this discussion.